Extreme sports performance, inimitable style: The MINI John Cooper Works Paceman. Elite performance model is based on the first compact Sports Activity Coupé. Driver and passengers in four individual seats enjoy racing feeling, turbocharged engine develops 160 kW/218 hp, standard equipment includes ALL4 all-wheel drive, an aerodynamic kit, 18-inch light-alloy wheels and lowered sports suspension. Munich. The MINI John Cooper Works Paceman combines mouthwatering sporting flair and inimitable style to introduce a new dimension in driving fun to the premium compact segment. Its race-bred powertrain and chassis technology create a recipe for smile-inducing agility, and the overall concept of the first Sports Activity Coupé in its class gives it an immediate, show-stealing impact. The MINI John Cooper Works Paceman transfers the power developed by its 160 kW/218 hp four-cylinder turbocharged engine to the road with poise and assurance, courtesy of its standard ALL4 all-wheel-drive system. Lowered sports suspension and an aerodynamic kit also play their part in bringing an irresistible feeling of race competition to the driver and passengers in their four individual seats. The MINI John Cooper Works Paceman celebrates its world premiere at the North American International Auto Show (NAIAS) in Detroit in January 2013; its market launch will follow in March 2013. The new arrival swells the John Cooper Works ranks to seven models. The MINI John Cooper Works Paceman’s driving characteristics and design ensure it will stand out from the crowd in city traffic, as well as being the car of choice when maximum driving fun over longer distances is the order of the day. Instantaneous power delivery and an unquenchable appetite for revs define the engine under the bonnet of the MINI John Cooper Works Paceman. The turbocharged power unit teams up with a six-speed manual gearbox as standard; a six-speed automatic can be ordered as an option. The MINI John Cooper Works Paceman sprints from 0 to 100 km/h (62 mph) in just 6.9 seconds with either of the gearbox variants. Yet despite this intoxicating turn of speed, fuel economy is exemplary for its output class. The MINI John Cooper Works Paceman posts average fuel consumption in the EU test cycle of 7.4 litres (automatic: 7.9 litres) per 100 kilometres / 38.2 (35.8) mpg imp. 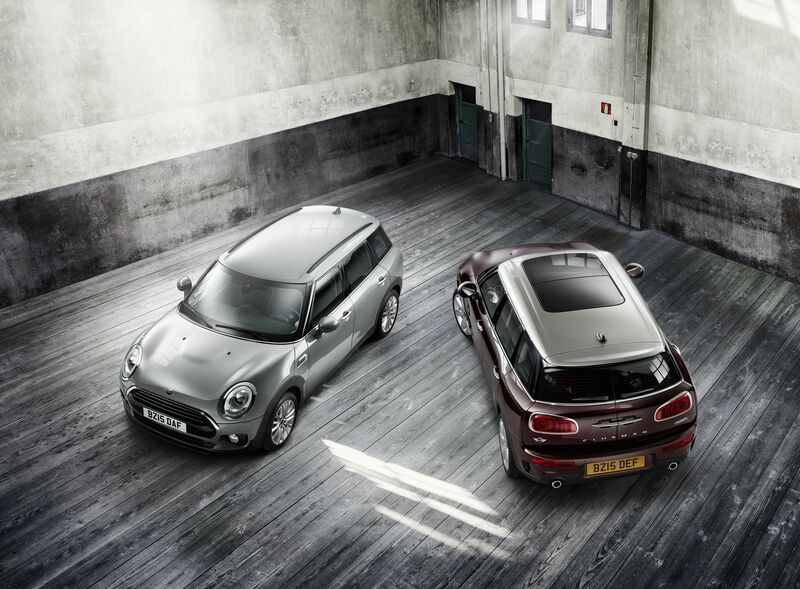 The distinctive character of the MINI John Cooper Works Paceman is underlined by bespoke design features. 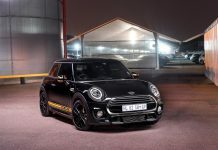 Standard specification includes an aerodynamic kit, 18-inch light-alloy wheels, a sports exhaust system with chrome tailpipes, and door sills bearing the John Cooper Works logo. As well as white and black, the exclusive Chili Red paint finish can also be specified as an option for the contrast-colour roof and exterior mirror caps. 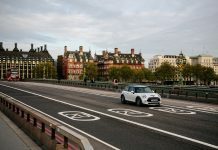 And customers can also lend an extra edge to the typical John Cooper Works sports car feeling inside the car with bespoke accents such as Chili Red interior trim strips. The engine: dynamism in spades, fuel consumption in sips thanks to racing expertise and MINIMALISM technology. The MINI John Cooper Works Paceman draws its power from a 1,598 cc four-cylinder engine. The latest generation of the John Cooper Works turbocharged unit blends motor sport-inspired technical details with cutting-edge innovations developed by the BMW Group’s powertrain experts. Highlights include reinforced pistons, low-weight crankshafts, an aluminium cylinder block and bearing mounts, and further optimisation of the cooling system, air supply and exhaust gas discharge system. Plus, the turbocharger is twinned with a generously sized intercooler. The twin-scroll turbocharger joins forces with petrol direct injection and variable valve control based on the BMW Group’s VALVETRONIC technology, which optimises both the engine’s efficiency and its responsiveness. The MINI John Cooper Works Paceman’s powerplant develops its maximum output of 160 kW/218 hp at 6,000 rpm. Peak torque of 280 Newton metres (207 lb-ft) is on tap between 1,900 and 5,000 rpm, and can be increased to 300 Newton metres (221 lb-ft) for short periods between 2,100 and 4,500 rpm using the overboost function. This opens the door to gratifyingly vivacious acceleration to which the standard-fitted sports exhaust system provides a suitably stirring soundtrack. ALL4 all-wheel drive as standard, six-speed automatic gearbox optional. The MINI John Cooper Works Paceman channels the extraordinary power produced by its front-mounted transverse engine through all four wheels as standard. The ALL4 all-wheel-drive system developed for MINI uses an electromagnetic centre differential to distribute drive seamlessly between the front and rear axles. This means power is always sent to the wheels where it can be translated most effectively into forward propulsion. 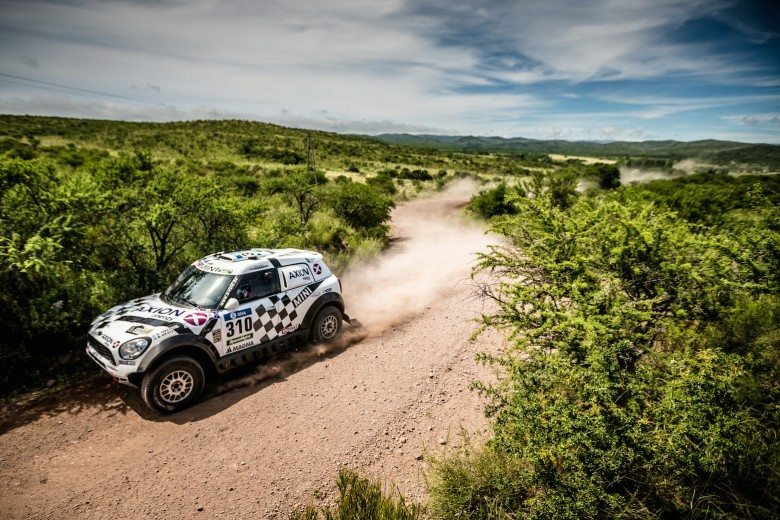 In normal driving situations ALL4 diverts a maximum 50 per cent of the engine’s power to the rear wheels, rising to as much as 100 per cent in extreme conditions. This provides a traction-led expression of the handling talents for which MINI is famed – whatever the weather and road conditions. The control electronics of the MINI ALL4 system are integrated directly into the DSC (Dynamic Stability Control) management unit, which gives ALL4 extremely short response times and allows it to carry out proactive adjustments in the distribution of drive. The system uses the data collected by DSC to tweak the power split pre-emptively and to impressive effect through dynamically taken corners, for example. And that means the driver enjoys outstanding agility combined with surefooted driving characteristics in customary MINI style. The MINI John Cooper Works Paceman can be ordered as an option with a six-speed automatic gearbox as an alternative to the standard-fitted six-speed manual. Both the transmissions and the manual’s clutch have been adapted to handle the engine’s impressive power and play their part in ensuring outstanding performance coupled with further improvements in efficiency. The automatic’s Steptronic function, meanwhile, gives the driver the option of changing gear manually using the selector lever on the centre console or the shift paddles on the steering wheel. The choice of gearbox has no effect on the sprinting power of the MINI John Cooper Works Paceman. 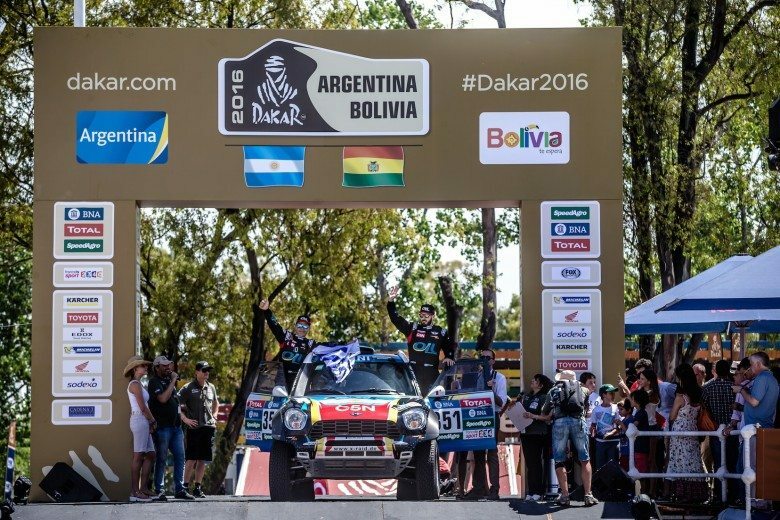 The new car dashes from rest to 100 km/h (62 mph) in a trifling 6.9 seconds, regardless of whether the engine is sending its power through the manual or automatic conduit. Top speed stands at 226 (140 mph) for the manual version or 224 km/h (139 mph) for the automatic. The MINI John Cooper Works Paceman marries this impressive performance with eye-catching economy. The engine’s inherent efficiency and extensive MINIMALISM technology – such as Brake Energy Regeneration, the Gear Shift Indicator and the Auto Start/Stop function (on manual cars) – are the trump cards here. Average fuel consumption in the EU test cycle is 7.4 litres (automatic: 7.9 litres) per 100 kilometres / 38.2 (35.8) mpg imp, and CO2 emissions come in at 172 (184) grams per kilometre. Developed to deliver visceral racing thrills: chassis, aerodynamics, design and interior tuned to John Cooper Works specification. Another key player in giving the MINI John Cooper Works Paceman its sky-high levels of driving fun is chassis technology optimised specially for the new model; a MacPherson spring-strut front axle, central-arm rear axle, Electric Power Steering and an extremely high-performance braking system make a potent team. The standard sports suspension has a dynamically optimised spring/damper set-up and stronger anti-roll bars, and is lowered by 10 millimetres. The standard DSC (Dynamic Stability Control) system also comprises DTC (Dynamic Traction Control) mode. And the likewise standard Sport Button on the centre console allows the driver to tweak the engine’s responses and soundtrack, as well as the power assistance provided by the steering. If the automatic gearbox is specified, pressing the Sport Button also quickens up shift times. 18-inch light-alloy wheels in Twin Spoke Black Burnished design with polished spoke fronts and black rim wells are standard on the MINI John Cooper Works Paceman. Among the items on the options list are exclusive 19-inch light-alloy wheels in Cross-Spoke Crusher design. The extrovert design of the MINI John Cooper Works Paceman gives the first Sports Activity Coupé in the compact segment a dynamic presence, brimming with forward-surging intent and agility – before it even turns a wheel. The powerfully formed front end, elegantly sporty, stretched lines of the flanks, coupé-style roof swooping downwards towards the rear, and broad rear end of the three-door car all ooze sporting allure. And the aerodynamic kit fitted as standard on the MINI John Cooper Works Paceman shines extra light on this performance-maxing character. The particularly muscular form of the front and rear aprons and bespoke side skirts ensure the airflow around the car is even more efficient. 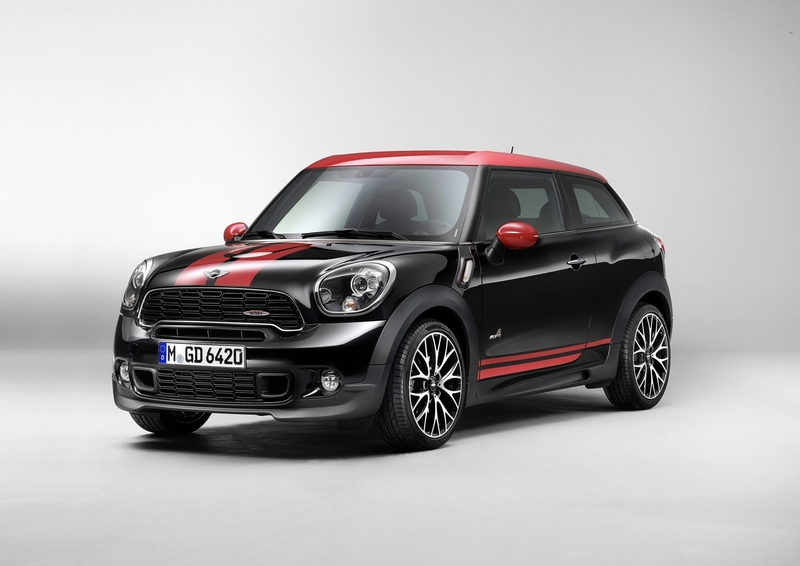 John Cooper Works logos on the radiator grille, tailgate and door sill strips as well as next to the side indicators provide additional confirmation of the car’s identity. Customers can choose from nine exterior paint finishes, including the Chili Red shade reserved for the John Cooper Works model. 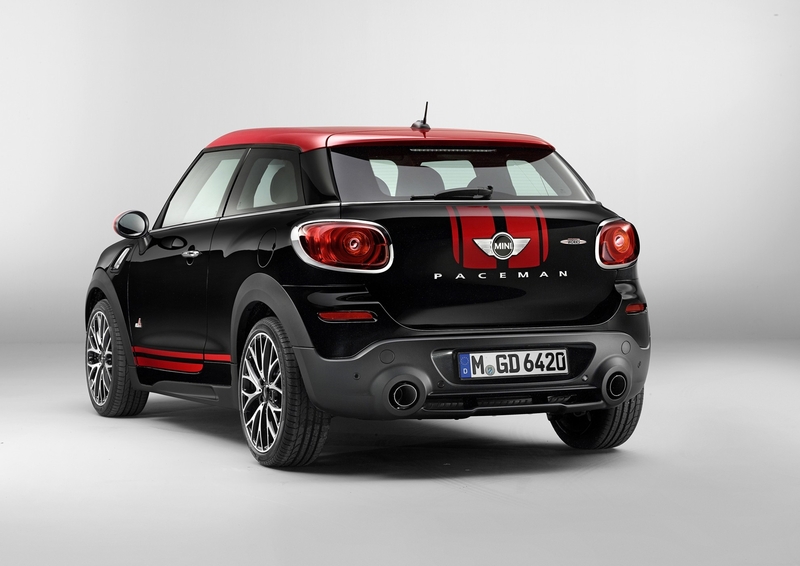 Chili Red is also available exclusively for the MINI John Cooper Works Paceman’s contrast-colour roof, exterior mirror caps and Sport Stripes. Inside the car, the distinctive interior design combines with the customary sports car ambience of John Cooper Works models to particularly alluring effect. The rear compartment of the MINI John Cooper Works Paceman features a pair of individual seats in which the rear passengers can enjoy that unmistakable racing feeling in lounge-style surroundings. A sports steering wheel with red contrast stitching and John Cooper Works logo, dark-coloured dials for the 260 km/h (160 mph) speedometer and rev counter, anthracite-coloured roof liner, gearshift lever with red shift pattern lettering, red contrast stitching for the gearshift lever gaiter and floor mats with red stitching are all part of the standard equipment count for the new extreme sports model, as are cloth sports seats in Diagonal Track John Cooper Works Carbon Black trim with red contrast stitching. Lounge Leather sports seats in Carbon Black Championship Red are available as an option. Standard Piano Black interior trim strips add the finishing touches to the racing-inspired aura inside the MINI John Cooper Works Paceman. Exclusive Chili Red trim – consisting of red elements for the cockpit and doors and a red stripe for the black trim strips on the centre console – can be ordered as an option. MINI at the 2018 South African Festival of Motoring. 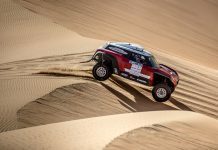 Rally Kazakhstan 2018 – Round 5, FIA Cross Country Rally World Cup.